You can’t have one of every type of oriental hand-knotted rugs in your house. Where would you put them? Unless you have a château or deux châteaux. When it comes to rugs even the most experienced collectors hunt for a new different piece of art and here they will find something truly appealing. No matter if you want to buy a hand-knotted masterpiece to hang on the wall or a carpet for your living room, you should know that there is something even more unique than the legendary Persian rugs. 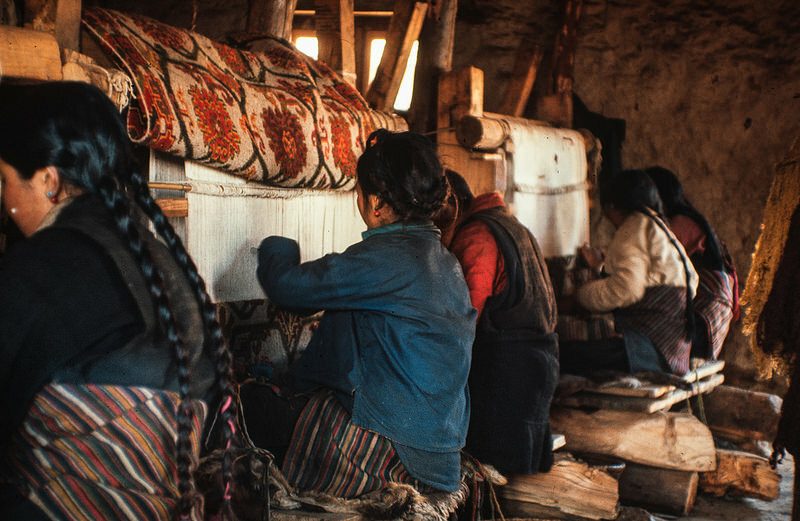 They are nomadic by origin, Tibetan by name, Nepalese by the country of production and unique because of their knotting technique. Tibet also nicknamed the roof of the world or the water tower of Asia is at the center of this story. When it comes to the best places to visit in a lifetime, Tibet is at the top and not only in terms of elevation above the sea level. According to Lonely Planet, the epic scenery of mountains, monasteries and endless lakes in the plateau changes the way how people will see the world. The first thing that visitors notice in Tibet is the deep blue color of the sky and water. Indeed, the color of Tibetan sky is completely different from other places. This distinctive scenery has shaped the culture of its people during centuries. It explains the importance of light and dark shades of blue in Buddhism. It is related to the infinity and the silence of the sky, immortality and deep unknown and it is also considered as the color of distant heavens. This explains why statues in Tibet have their hairs colored in blue and the importance of the lapis lazuli gemstone. The stone was used in Europe by well-known artists during the Renaissance in order to attain the ultramarine pigment. Many famous painters like Michelangelo left artworks unfinished due to the lack of this pigment. On the other hand, people in Tibet learned how to make it part of traditional Himalayan art and handicrafts. As mentioned above, Tibetan rugs have a nomadic origin. They were used for sleeping and saddles. Currently, what is sold under this name is made by the Tibetan people that fled to Nepal during the early sixties. The route of these rugs from Asia to Europe started when a Swiss agency decided to support the Tibetan refugees in Nepal and helped them to find a source of income by through the production of hand-knotted rugs. At first they were sold to tourists and afterwards the rugs were shipped to Switzerland and other countries in Europe and the United States. What makes these rugs rare is their knot. Its structure is completely different from other knots used by carpet weavers in Asia or other continents. These rugs reflect a long tradition of cultural expression sometimes influenced by surrounding cultures and in other cases completely original. What makes these rugs rare is their knot. Its structure is completely different from other knots used by carpet weavers in Asia or other continents. They are weaved in a cotton based warp. The knot is one of the few elements that current rugs have in common with those weaved centuries ago. Common colors used for backgrounds are red, blue, black and orange while the main colors for the motifs include beige, white, yellow, blue, orange, green, red. Some colors are reserved for use in monasteries. One lotus, two lotuses, three lotuses. All flowers in Tibetan rugs are lotuses. Floral Tibetan rugs include few of them or only one large flower combined with dragons, phoenixes, and clouds. The symbols on Tibetan rugs have Buddhist origin. Although that such designs can make Tibetan rugs look like Chinese rugs, there are several distinctions. For example, in Chinese art phoenixes are in mid-flight while in Tibetan rugs they are on land. There is no specific design for every region. This makes them different from other oriental rugs, which are named after the region where they are weaved. On their part, Tibetan rugs have fantasy names. Many rug sellers emphasize the quality of Tibetan rugs saying that they are made by the best wool of sheep from the Plateau of Tibet. The truth is that they are made of high-quality wool from India or New Zealand, because Tibetan wool is too expensive due to economic restrictions. Another thing to know is the size. The original Tibetan rug was small. Nowadays, these rugs are made in different sizes. Native Tibetans produced small rugs, the large ones have been mostly invented by western traders. The important thing to know is that they are not too expensive like other oriental rugs.